Job postings usually have closing dates. These dates give applicants a timeframe for hiring and get the organization moving on with the hiring process. Despite online applications systems that tell where applications are in the hiring process, applicants can never know where they stand until it is all over. The closing date at least gives them a data element for making an educated guess about when they can forget about getting hired. Organizations use the closing date to draw a line in the sand for rejecting late applications. The date justifies throwing away applications that come in after the deadline. Working without a closing date complicates the process for hiring managers and human resources professionals because they do not have a publicized date by which they can easily cut off receiving applications. However, there are a few circumstances when working without a closing date is advantageous to the organization. Large government organizations that focus on a few discrete functions often have major subsets of employees who all do the same job. For example, major metropolitan cities have hundreds and sometimes thousands of police officer and firefighter positions. These cities may choose to advertise a job posting without a closing date — human resources staff members screen applications as they come in. Those that do not meet the minimum requirements are rejected. Organizations handle such applicant pools differently, but most either hold accepted applications in the pool for a predetermined period or use all accepted applications for the next vacancy. With the first option, applicants are encouraged to reapply once the timeframe runs out. Organizations do not want to hang onto applications indefinitely because people become disinterested in the job over time. Under the second option, organizations often hire several people at a time. They may keep promising applicants in mind when future positions open up. Otherwise, applications are discarded after each hire. Highly specialized positions are those jobs that require a new hire to have a very specific set of skills or qualifications. These positions take a long time to fill because there are not very many people who meet the criteria. Organizations advertise these job postings without closing dates because they do not expect to get very many applicants. If they did include a closing date, chances are they would have to extend or repost the position. It is easier to leave the posting open for an indefinite period of time. Organizations run a risk of early applicants losing interest in the position. Say an organization gets one applicant each month for six months. If the organization waits the full six months to interview anyone, it is unlikely that the first one or two applicants are still interested in the job. They probably have accepted another position or would be leery of working for an organization that takes five or six months to contact applicants. Waiting this long is a trade-off. Hiring managers have more applicants to choose from, but they are less likely to have a job offer accepted. 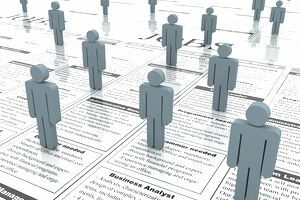 Hard-to-fill positions are ones that either garner a small pool of qualified applicants or often have job offers turned down. These positions can be challenging to fill for many reasons. Common reasons include extremely demanding work, low pay relative to the local job market and a local workforce with few people who meet the minimum criteria. Highly specialized positions as discussed above are usually hard to fill. Organizations may choose to post without a closing date to get a larger applicant pool. This increases the likelihood that they’ll find an acceptable new hire. Sometimes organizations are happy to get a warm body in the position.